Legends of the Diamond’s big chase card was apparently hit. According to this eBay auction , the big card is out of the product. These boxes are hard to find right now. If you do, the price is close to $300. So what happens when a big chase card is hit? 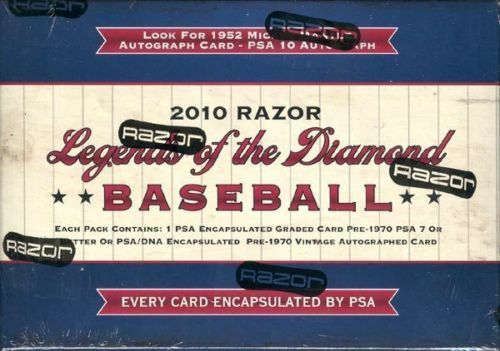 This product was filled with enough decent vintage cards that it may still warrant a $285 price tag, but how many people still want to pay that price knowing the big card is no longer available. In Razor’s other graded packaged product, Razor Rookie Retro, the 2010 Bowman Stephen Strasburg superfractor seems to still be out there as well. If it’s not, someone is keeping quiet. How many people bought the product hoping to hit this card knowing it sold for more than $15,000 both times it hit the secondary market? Sure, most people don’t actually think they are going to pull the card, but we all know how it goes. You go to open the shrink wrap on the box, but can’t seem to find a seam. Finally, after fighting with it for five minutes, you grab a scissor and run the sharp side over the plastic that melts as easily as butter. Anything keeping you from your precious card is just a nuisance, so you fling the shrink wrap into the garbage, only for it to get stuck on your hand. Your hearts speeds up a little as you finally get the shrink wrap on the floor next to the garbage. Now, it’s time to take off the stickers and get to your money card. You pull off the stickers, which slide right off, forgetting they aren’t there for anything more than show. You slowly open the box, but it is stuck. As you fight with the box, trying to figure out which side is supposed to come off easiest, you drop the entire box and your card goes flying across the floor. You run after the card. Slowly pick it up. But your eyes are closed because you’re too afraid to see if there was any damage. Thankfully, you think, it’s in a slab, but how strong can these things be? You flip the card over to the front. You peek with one eye. There’s light shining against the chrome. Your eyes pop open. That’s when you kick the card under the dresser and shred your credit card. But in the moment before you saw the card, you thought you had it. You thought that your box had the chase card. That’s why we buy. That’s why we spend money we don’t have on cards. All for the chase. That's an awesome card, except for the fact that someone wrote on the front, it was stamped with an "invisible" mark, and it was slabbed. Why can't people let cards be cards. "Now where am I going to find last month's car payment?" What is the difference between cracking open a box of Razor product and a Reno gargoyle watching the reels spin over and over again? The difference is at least $285.75....and that the gargoyle cracking Razor is typically male. What's the difference between a Razor product and a Fairfield Jumbo repack? At least $280 and that clammy chance at the equivalent of a lotto scratcher win. Yeah, yeah, I know. The lottery ticket motivator in the hobby is as old as it gets. Doesn't mean that I have to like it or the so-called "new" products that are basically elaborate repacks of somebody else's (usually) old product. I just don't want to pay $300 for fresher junk wax like Rasmus.